It could be said that the composite forces formed of local mercenaries and Portuguese fighting the Dutch and French in the beginning of the 17th century were an ancestor of the future Brazilian Army. All along the 19th century, the Brazilian forces changed in composition and organization but were largely forged by wars: The Independence war which lasted until 1825, the Equator Confederation (1824) war, Cisplatine War (1825–1828), Malê Islamic uprising (1835), Cabanagem, Sabinada, Balaiada and Praieira Revolts (1835–1849), the Ragamuffin War (1835–1845), the Platine (1851–1852), Uruguayan (1864–1865), and Paraguayan Wars (1864–1870), the Naval Revolt (1893–1894), the Federalist War (1893–1895) and the War of Canudos (1896–1897), the Acre Revolution (1899–1903) and the Contestado War (1912–1916). The battle of Caseiros, part of the Platine War (1852). The XIXth century saw the army divided into two branches, the 1st line infantry (regular) and the 2nd line militias and orderlies. Under Emperor Pedro I in the 1820s, the regular army numbered 24,000 as well equipped and trained as any European Army. Cadets and future officers were trained at the Academia Militar de Agulhas Negras which was also an engineering school. Many rebellions took place in the local provinces, making the deficiencies of the army clear and leading to its reform in 1845. In particular, the old Military College was widened and doubled. The emphasis was put on a better training for officers. By 1857, on the eve of the Platine War against Argentina, the Brazilian army was 37,000 strong and proved itself by winning the war. However deficiencies were put in light during the Uruguayan and Paraguayan wars. The National Guard was neglected, whereas the regular Army was enhanced with the addition of the Fatherland Volunteer Corps in 1865. Tactics and equipments were modelled after the Prussian Army, and it proved itself during the very long Paraguayan war inside the triple alliance. Although there was a guerilla war taking place on its soil, the Contestado war, Brazil declared war on the Central Powers shortly after the USA. Brazil sent three small military groups to France. After some training, they were attached to the French Army and took part in some engagements in 1918. 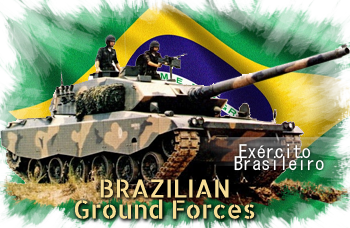 It was nevertheless a valuable experience for the Brazilian Expeditionary Force, as it had the first contact with tanks and their use in action for the first time. Situation however was turbulent in the 1920s and 1930s. The new conservative government backed by the Army crushed a Constitutionalist Revolt in 1932 and prevented a communist and fascist (1935 and 1938) coup d’états. However a military dicatorship was in place by 1937. Brazil had a few tanks, of the French ww1 FT type, of which the pruchased was arguably the work of Captain José Pessôa Cavalcanti de Albuquerque. he was also the officer in command of the 1st tanks company. However, the situation was turbulent in the 1920s and 1930s. The new conservative government, backed by the Army, crushed a Constitutionalist Revolt in 1932 and prevented communist and fascist (1935 and 1938) coup d’états. Brazil had few tanks, mostly French Renault FT vehicles. Their purchase was arguably the work of Captain José Pessôa Cavalcanti de Albuquerque. He was also the officer in command of the 1st Tank Company. By August 1942, after German and Italian submarines sunk many Brazilian merchant ships, the government formally declared war on the Axis, with popular support. The 25,000 strong Força Expedicionária Brasileira (FEB) was created to join the Allies. It was sent to the Italian front, led by general João Baptista Mascarenhas de Morais. It was fully equipped by the US Army although the bulk of the forces consisted of infantry. Some organic tank batallions had M4 Shermans and M3 Stuarts though. The BEF liberating the Italian city of Massarosa during the spring 1945 offensive. The first 12 Brazilian “carros de asalto” were Renault FTs acquired in 1921. They saw action during the 1924 rebellion and the 1932 revolution, and remained in service until the 1950s (for training). The M3 Stuart Light Tanks were in service with the BEF throughout Italy and until the surrender of the Axis. Shipped backed to Brazil, they were kept in service until the 1970s, when they were partly modernized by the Bernardini company. 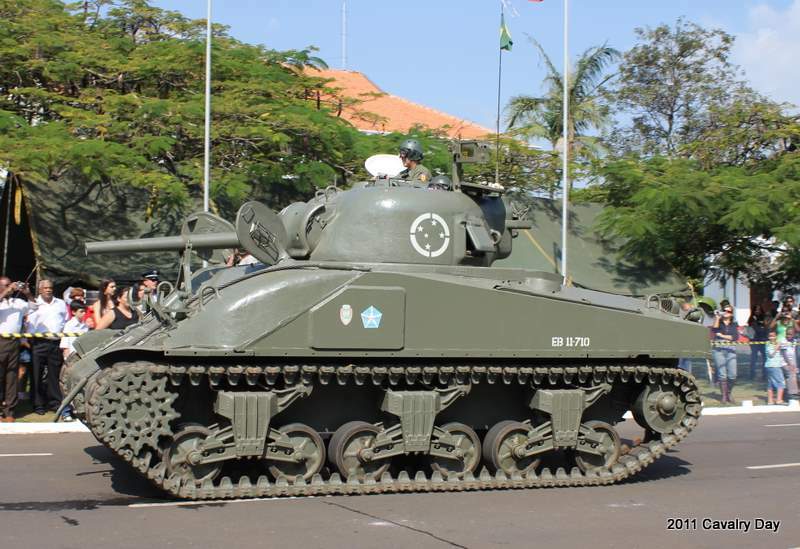 The Brazilian Bernardini X1A2 was the last of a series of quite radical modifications made to the M3 Stuarts used by the Brazilian army. 30 were produced/converted in the early ’80s and they were practically all-new vehicles. The Bernardini MB-3 Tamoyo was the most ambitious project of the Bernardini company, unveiled in 1983. It was based on the M41 Walker Bulldog and the program was initially named “X-30”. In 1978, the first prototype was rolled out, still fitted with the 76 mm (3 in) M32 rifled gun. Bernardini also tested its own 76 mm (3 in) M32 BR-3 gun. Another prototype featured Bernardini’s 40 cal 90 mm (3.54 in) rifled gun (Tamoyo I/II), while the last variant, the Tamoyo III, featured a 52 cal. 105 mm (4.13 in) rifled gun. There were also new sights, a new Ferranti Falcon FCS, complete with sensors, a digital ballistics computer and a laser rangefinder. A layer of composite material modules was added on the original RHA hull. It was propelled by a brand new powerplant, the Saab-Scandia DSI-14 V8 diesel giving 500 hp or the 730 hp Detroit 8V-92TA. Despite all its promises, including interesting modernization contracts for all M41 operators, the project was abandoned and financially wrecked the company. Charrua XMP-1 – tracked amphibious armored personnel carrier. Prototype built 1984. EE-T4 Ogum – Light tracked reconnaissance vehicle.